UNC Peers for Progress is proud to join the Michigan Center for Diabetes Translational Research (MCDTR) to foster rigorous translational research on peer support for the improvement of diabetes prevention, management, and quality-of-life. The new UM–UNC Peer Support Core is co-directed by Ed Fisher, PhD at UNC Peers for Progress and Michele Heisler, MD, MPA at the MCDTR. 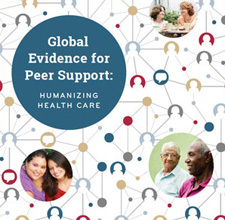 To provide investigators with access to expertise and resources on peer support in order to promote innovative research that will accelerate the adoption and dissemination of effective and cost-effective peer support interventions. To provide investigators technical assistance and training in peer support program development, implementation, evaluation, training, and quality improvement. To strengthen the networking between investigators at Michigan, UNC Chapel Hill, and other universities doing research in or interested in research utilizing peer support. (Chapel Hill, N.C. – Jan. 4, 2016) – The more social ties people have at an early age, the better their health is at the beginnings and ends of their lives, according to a new study from the University of North Carolina at Chapel Hill. The study is the first to definitively link social relationships with concrete measures of physical wellbeing such as abdominal obesity, inflammation, and high blood pressure, all of which can lead to long-term health problems, including heart disease, stroke and cancer. “Based on these findings, it should be as important to encourage adolescents and young adults to build broad social relationships and social skills for interacting with others as it is to eat healthy and be physically active,” said Kathleen Mullan Harris, James Haar Distinguished Professor at UNC-Chapel Hill and faculty fellow at the Carolina Population Center (CPC).